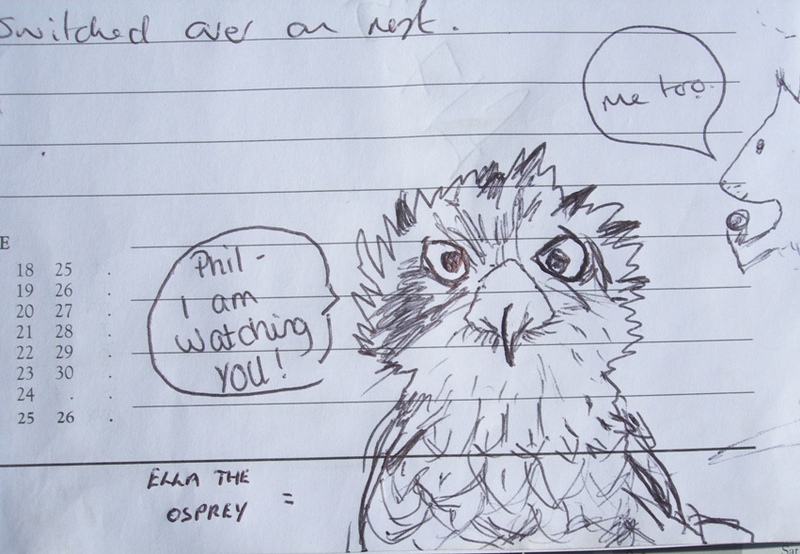 CRIME RATE AT OSPREY VIEWPOINT SOARS! 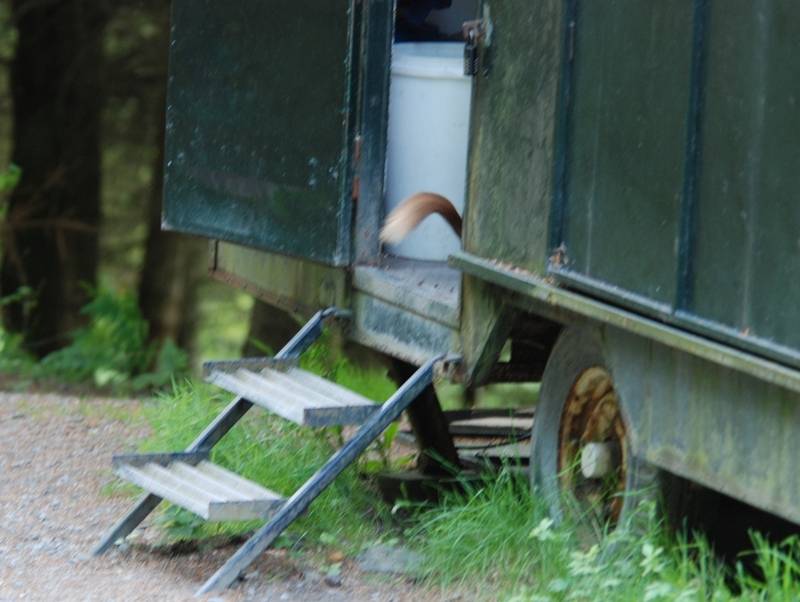 VOLUNTEER WELFARE UNIT RAIDED – 6 TIMES IN ONE AFTERNOON! 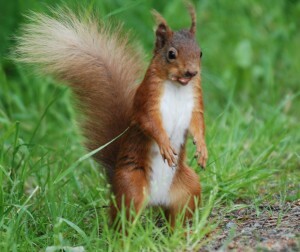 SUSPECT CAUGHT ON CAMERA REDHANDED – REDPAWED- REDMOUTHED! 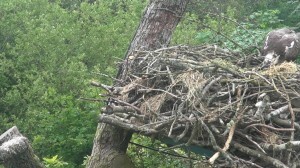 Click to download the Bassenthwaite Osprey family at breakfast! Dads do it with Fish! Just got back after an interesting evening. 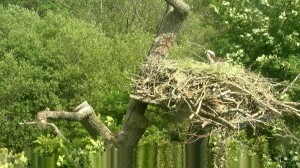 Male came back with a fish 8.30 and beheaded it on the branch below nest. He then flew up onto the nest. It was pouring down now and female was trying to get slivers off while staying low in the nest cup tp protect chick/s. 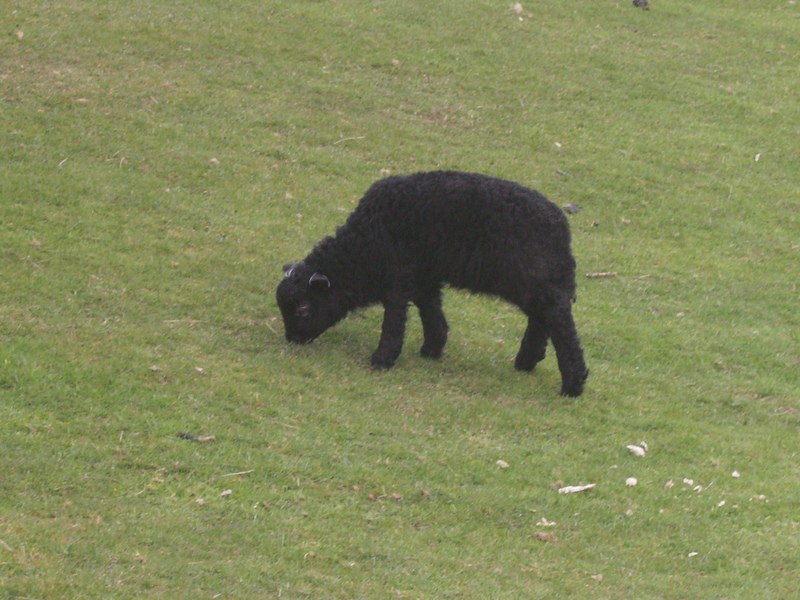 Male helped by getting slivers off and trying to feed chicks himself. She would have none of that so he proceeded to take off slivers pass them to her and she bent down to feed chicks. some quite high level reasoning skills! KL has scuppered our attempts to see the chicks again. Fresh cut silage grass by the footful has been placed just where it blocks the camera view.As the first chick is now a week old it should be the size of a gosling. KL and her mate have been doing a great job over the past few days. Our Lad has been bringing in fish by the bucketful so there is always something to feed the chicks on. We still cannot see into the nest cup but we think that another one did hatch on Saturday as it looks as if KL is popping food down in two different places at times. Could there even be three chicks? Monday would have been the last hatch date and indeed KL was brooding tightly up until this day. However, she is now behaving much more freely, going off to have a bath and leaving the chicks with Dad to keep an eye on them, so we know that there are no more eggs left to hatch. Unfortunately, although food was then always on hand to feed to the chick it proved to be irresistible to the crows also, one of which actually squatted on the side of the nest, ducking away just out of reach every time KL lunged at it. The pair still haven’t learned how important it is to tidy up after every meal. Going back to the eggs, today could see the egg number two hatching as it is due two days after the first. However, as we are still not able to see anything but a slight flicker of movement occasionally through the woven wall of sticks we will have no way of knowing until we can count heads above the parapet. We can confirm that we have at least one chick ! Behaviour yesterday (Thursday) evening saw KL becoming very restless and ‘fidgety’ around the nest bowl. Protection reported her putting some small morsels of food into the nest last night, and today we have seen food going into the nest at two to three hour intervals. How many there are, we do not know, but we expect any other eggs to also hatch in the next few days, but it is impossible to speculate. Rest assured, this new pair of birds have now produced another generation of ospreys adding to the English population, and the LDOP moves into a new phase in 2013. Well! We have never seen a bird more excited than KL this Thursday afternoon. For the past 48 hours action on the nest has quietly increased a little with KL taking more frequent comfort breaks rather than allowing her mate to incubate for any length of time and he in turn bringing in stick after stick – often as an excuse to try if he can have a quick 5 mins brooding. However, there were no real signs of eggs hatching. But, today at about four o’clock KL’s behaviour changed dramatically. Ants in the pants, fleas in the basket, or even peas under the mattress do not adequately describe our princess’s action in the nest. 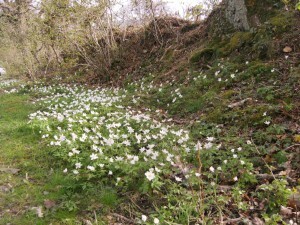 From spending 36 sedate days with occasional turns of the eggs she was now wriggling, standing, sitting, hunkering down, turning around, jumping up as if being nettle stung, re-arranging her feet nearly continuously and over and again looking down between her legs. Sometimes it seemed like any chick that might be hatching would have only two choices – to be pummelled to death in a feather blanket of flailing breast feathers or rolling-pinned over by an unhatched egg! For everybody watching on the CCTV it was just as exciting we also craned up and down trying to see between the interlaced sticks and grasses to what was happening on the floor of the cup – a glimpse of an eggshell, the flutter of a tiny body….. To no avail – Fred’s house design scuppered all our efforts. So, we will just have to wait until tomorrow for the classic confirmation of a live chick – when hopefully, that first fish is torn into tiny shreds and KL dips her beak down into the nest to feed her offspring. 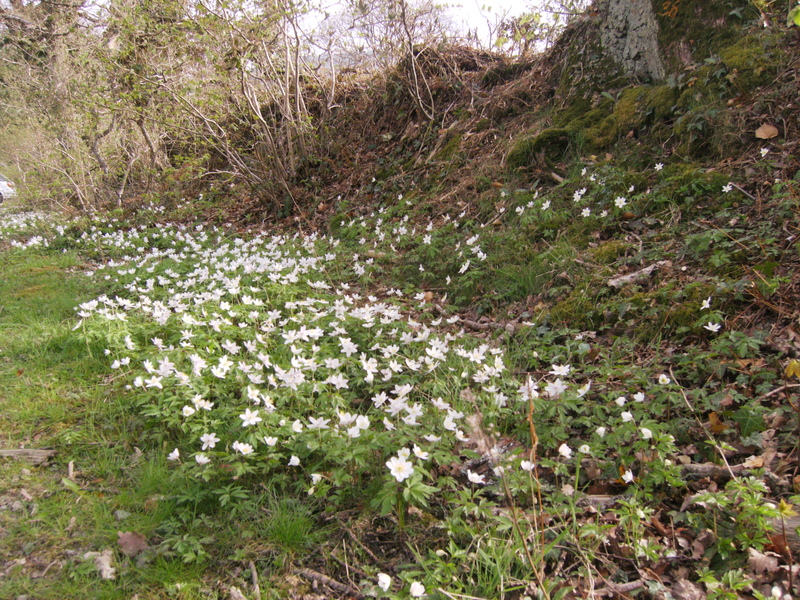 Photo – Windflowers on a Bassenthwaite bank – white as a flock of new-hatched ospreys. With bated breath we have been awaiting Day 35, which is the first day that an egg could have hatched. (If you remember KL started sitting on May 7th.) All day we have been staring at the CCTV screen hoping for some signs that a chick had cracked its way out of an egg shell. Tantalisingly there were a slight behavioural changes with the adults coming and going from the nest slightly more often and KL standing up more regularly. However, the clinching factor would have been when the afternoon fish came in. Would KL take it to the nest and make her first attempt to feed a chick, dipping her head into the nest cup with tiny bits of fish held at the ready? The answer was ‘No’. In fact she continued eating on the nearby branch for quite a few minutes after her mate had flown off the eggs. To be fair if a chick HAD just hatched it would need a good rest before feeding. Breaking through shell must be like chipping through concrete with a pick-axe strapped to your nose and only neck muscles to power the swing. It can take some time. Let’s see what tomorrow brings. 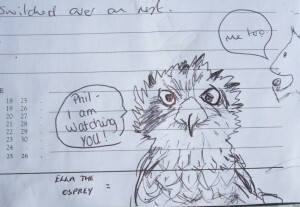 The police were called to the Lake District Osprey Project nest site this week when a man was seen directly below the nest tree using binoculars and taking photographs of the nest. Our sharp eyed protection team were quick to respond and squad cars moved in from both Keswick and Cockermouth within minutes. The Ospreys were off the nest for sixteen minutes due to this disturbance but quickly settled down again once the nuisance was removed. In this case the person concerned was guilty of foolishness rather than malicious intent but with the Osprey eggs due to hatch in the coming week caution is certainly the watchword. 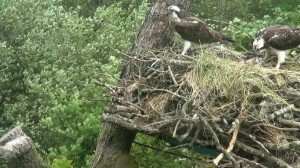 The Osprey family can be watched legally from the viewpoints at Dodd Wood and by CTV from Whinlatter Forest Visitor Centre.